Have you always wanted to wish Grandma a happy new year at the stroke of midnight but can’t bring yourself to drunk dial her from the party? Facebook has a solution. 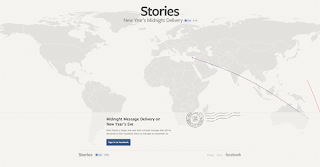 The social network’s Midnight Message Delivery service will send a private “Happy New Year” message to up to 10 friends’ Facebook inboxes at midnight Dec. 31. To use the feature, Facebook users need only go to the Facebook Stories page and select the people to whom they want to message. Although only 10 can be chosen, a user can actually return to the page and select other recipients at a later time. The default message is “Have a Happy New Year and a great 2013,” but users can personalize their own messages. Although the option will allow Facebookers to enjoy the early minutes of 2013 without trying to hammer out dozens of messages to friends and family, it could also quickly turn into holiday spam should it gain popularity. Who wants their inbox flooded with dozens—or more—of generic messages in the same instant?